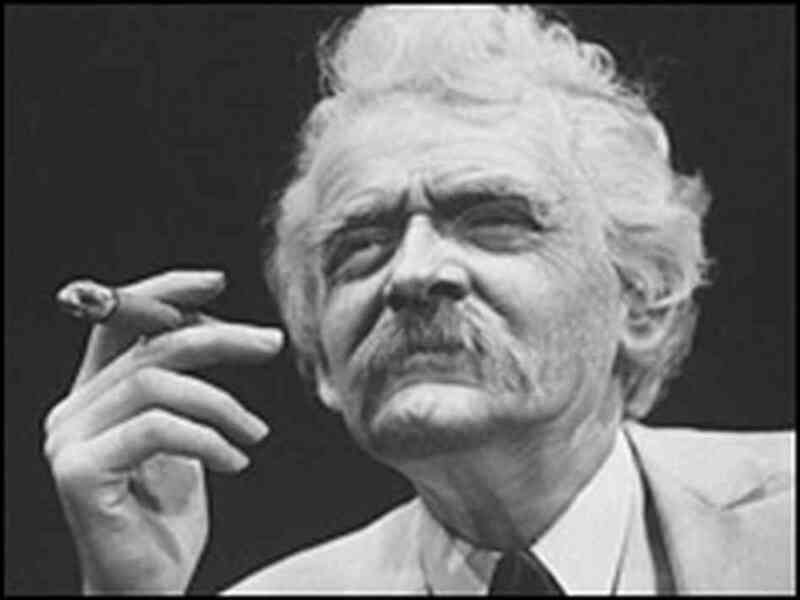 The first time I ever saw Hal Holbrook do his impersonation of Mark Twain, I think I was still in college. He first conceived of the idea and performed it in 1954, when he was 29. He’s now been performing Mark Twain Tonight for sixty consecutive years, and he doesn’t look ready to quit yet. The man is 89 years old, for heaven’s sake, fourteen years older than Samuel Clemmons himself lived, and he’s still going strong! At least he no longer has to spend a full four hours applying his make-up … only two! Last week, Joan and I slipped up to the historic and beautifully restored National Theater in Washington to catch the first of his two shows there. But …sorry. Unless you’re lucky enough to be in New Hampshire, you’ve missed it. 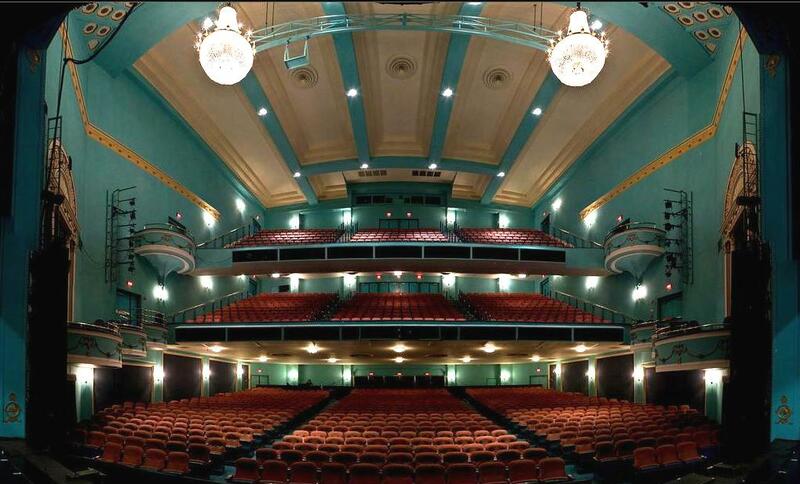 Tonight’s show (April 11) in Concord is evidently the last of his current limited tour. I believe I must have seen the now legendary performance at least three times over the years. 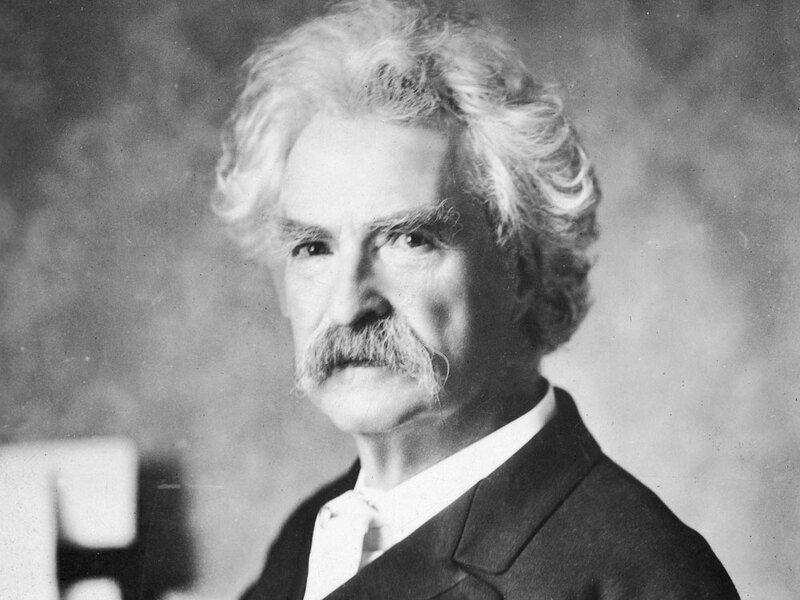 I have never grown tired either of Mark Twain or of Mr. Holbrook. I still periodically scour the Web, just to see if Holbrook will be touring nearby. Quite a remarkable man in his own right, he has spent virtually his entire life on the road. Somehow at the same time he has come away from roles in more than sixty plays and fifty movies, loaded down with Oscar, Tony, and Emmy award nominations and wins. And as for Mr. Twain himself, who famously came and went with Halley’s Comet (1825 and 1910 respectively), I have been a lifelong devotee since I first picked up Tom Sawyer at age 9. Some years later, by the time I had worked my way through all his other works, especially including “Letters from the Earth,” I joined the rest of the world in the conviction that no American writer would ever offer up a better or wittier impatience with sham and hypocrisy, especially in politics and religion. 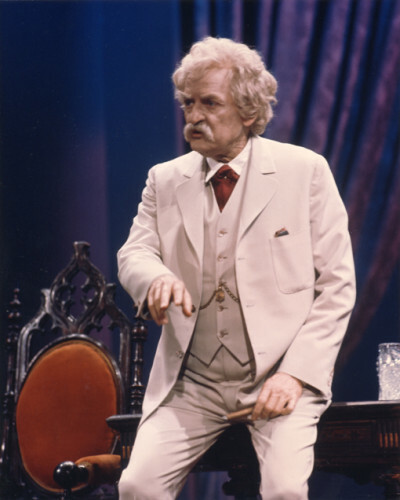 Hal Holbrook as Mark Twain. When he was younger, the makeup process used to take four hours. — Less, now! That this performance happened to be staged in the nation’s capital meant that Congress would bear the brunt of the evening’s relentless humor. I couldn’t help but wonder how many U. S. Cngressmen were sitting in the audience, laughing and applauding along with the rest of us, blind to their own hypocrisy (… which, it must be said, no doubt applies to the rest of us as well). 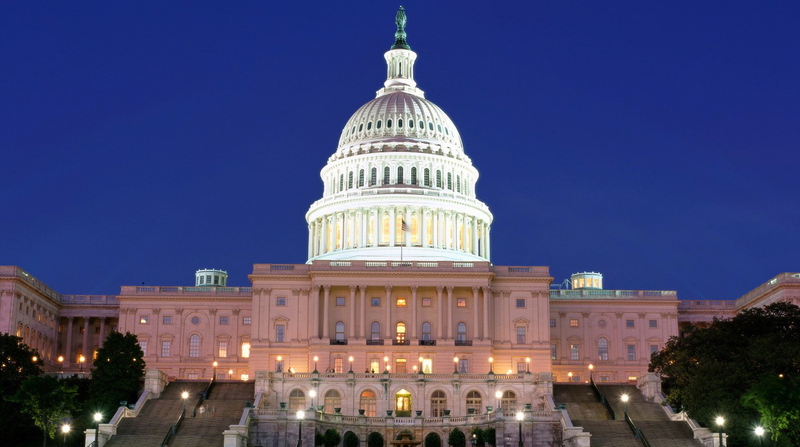 The timely relevance of the material is of course shocking: that in 120 years the United States Congress has not seen fit to improve itself one iota past what Twain labeled as “idiots and dumber than fleas!” I can’t resist ending my comments by sharing just three of Twain’s. This entry was posted in Rants, Theatre and tagged HAL HOLBROOK, HALLEY'S COMET, HUCKLEBERRY FINN, LETTERS FROM THE EARTH, MARK TWAIN, NATIONAL THEATER IN WASHINGTON, SAMUEL CLEMMONS, TOM SAWYER. Bookmark the permalink. Than you for posting this, Bill. 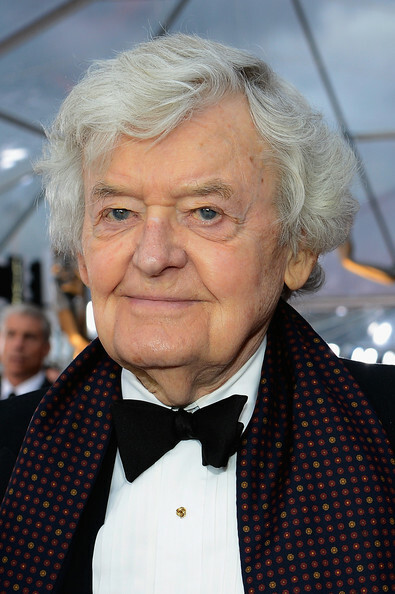 Am I to understand that Hal Holbrook mastered more material than is needed for one performance, and gets to select parts (or lines) to include or exclude each performance? Wow. Since moving to Napa and starting a novel set north of San Francisco in the nineteenth century, I have paid more attention to Mark Twain. His time in San Francisco means he might make it into my novel as a one-chapter minor character. One impressive aspect of Twain, to me at least, was his principled opposition to the Spanish-American War, especially to the brutalities often inflicted in the Philippines. I was put in mind of that when reading this week about the Senate’s secret report on CIA torture after 9/11. I’m glad that you got to see this last performance, and glad you shared it with us. I wonder if there was more Congressional corruption and incompetence in his time or in ours. Hi Steven. Yes indeed he does. The following note was included in the program, as it apparently always is: “While Mr. Twain’s selections will come from the list below [somewhere around a hundred possibilities as I recall] , we have been unable to pin him down as to which of them he will do. He claims this would cripple his inspiration. However, he has generously conceded to a printed program for those who are in distress and wish to fan themselves.” And he apparently chooses among them, both prior to and during his performance. Mighty impressive! I am looking forward to your novel. So good to hear from you. From your keyboard to an agent’s eyes! Publishing is in chaos these days, and a lot of literary agents are looking for other jobs (I suspect mostly as consultants to would-be writers). But we can’t let that stop us. By the way, as of a few years ago the Mark Twain house in Hartford, Connecticut, now a museum, was about to go bankrupt. What a shame.